2. When the results appear, look in the lefthand column and click Show search tools. 3. That should expand a group of time-related options. You'll see "Any time" highlighted by default, followed by choices like "Past hour," "Past 24 hours," "Past 2 days," and so on. 4. At the bottom of that group, click Custom range. 5. You'll immediately see a calendar selector. 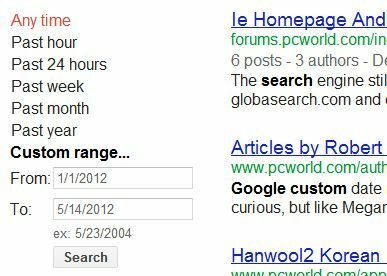 Choose your desired "From" date, meaning the date that's as far back as you want Google to search. 6. If you leave the "To" field blank, Google will automatically default to today's date. But if you want an earlier date, click that field and select it. 7. Click Search to see your results for your specified date range.